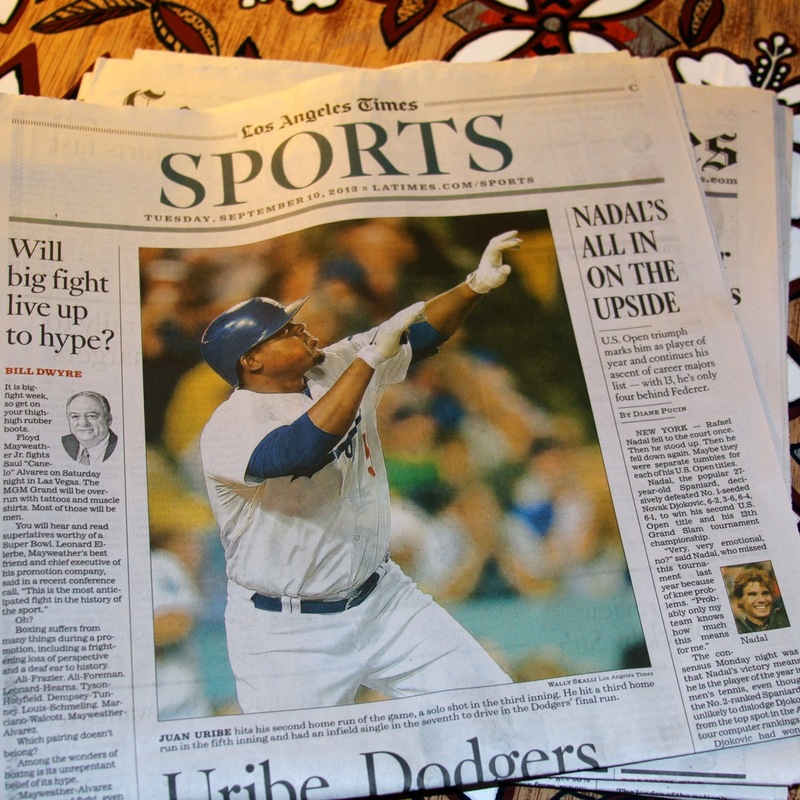 Nice photo in The Times by Wally Skalij shows Juan Uribe hitting one of three homers against Arizona. That sneaky third baseman of ours hit three — count ’em, 3! — home runs yesterday to lead the Dodgers to an 8-1 rout of the Arizona snakes and bring the Magic Number down to just 8. Just think! Only a few months ago we would let out a collective groan when Juan Uribe came to the plate. He was on the bench as then-starter Luis Cruz took the hot corner. But Cruz cooled and went to Yankeeland, and Uribe discovered some languishing ember of greatness and stoked it into a fire. Now he’s one of the best-fielding third basemen in baseball, he’s hitting like a champ, and he even walks a lot more often than before, when he would swing wildly at every pitch he saw. His story of redemption is rivaled only by that of the team itself. Last year’s miserable finish and this year’s miserable start are ancient history, just as the boos that greeted the ex-Giant Uribe have morphed into standing O’s and curtain calls.